The Denver Nuggets are coming off of one of their most interesting games of the entire year in Portland. The loss left many still questioning what it is that actually happened. Head coach Michael Malone elected to rest a majority of his starters for the Nuggets’ sixth games in nine nights. 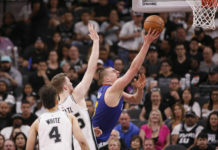 He rested Jamal Murray, Paul Millsap and Nikola Jokic against the Portland Trail Blazers it looked as if Denver would still somehow manage to win an improbable game until Malone, once again, decided to leave the second unit on the floor for the remainder of the game and not the likes of Will Barton, Gary Harris or Monte Morris. 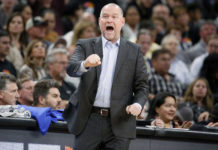 This decision by Malone angered many fans as it appeared to be a ploy to purposely lose the game and to help move the Trail Blazers into the third spot in the Western Conference playoff seeding. Malone later denied that was the case. 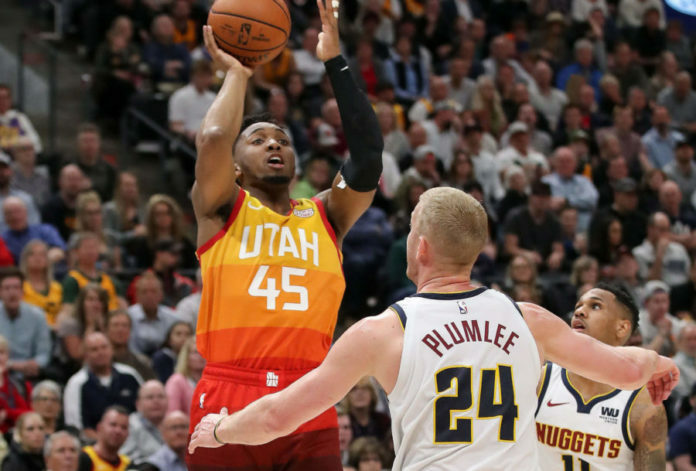 Regardless of if it were the plan or not, things shook out in the Nuggets favor on Tuesday despite the Nuggets losing a road game against the Utah Jazz. While Denver lost the game 108-118 in Utah, it ultimately ended up being a win as the Oklahoma City Thunder beat the Houston Rockets on a 3-pointer in the closing seconds by Paul George. Now, Denver has the opportunity to lock up the second seed in the West with a win on Wednesday against the Minnesota Timberwolves. In a game full of ups and downs that saw Nikola Jokic have arguably his worst game of his entire career, I give you the good, bad and ugly. Although Denver ended up losing to the Jazz, one of the biggest things to take away from the Nuggets last two games that is a great sign for Denver is getting Garry Harris back on track. Harris has not looked like the same player since suffering a right hip and hamstring injury that sat him down for a significant amount of time. Once Harris got back, it was about getting his legs, conditioning and rhythm back. Harris has put together two-straight games where he looked like the Harris of old. In Denver’s loss to the Trail Blazers, it was Harris that led the way. He had 18 points and two steals in only 23 minutes before sitting down for the fourth quarter. He followed that up in Tuesday’s contest against the Jazz with another solid game. Harris was able to move well, showed the explosion he had pre-injury and was able to score the basketball as he finished with 15 points and a steal. Another positive in the game was the play of the second unit. In a hostile atmosphere with plenty on the line and not the same type of production from the starters that the Nuggets are used to, it was bench that kept Denver in it. Denver’s bench outscored Utah’s bench 64-18 and got a much-needed push from Malik Beasley and Monte Morris in particular. 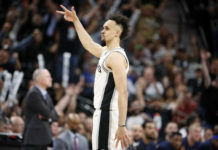 Beasley led the Nuggets in scoring and had 25 points (9-13 from the field) while also knocking down five 3-pointers as well. Morris finished with 22 points (8-13 from the field) with four assists and three rebounds and did not have a turnover in the game. The West just got a bit more complicated. With Denver’s loss coupled with the Thunder edging out the Rockets as well as the Portland Trail Blazers winning in Los Angeles against the Lakers, the West was shaken up yet again. Denver now has to win against the Timberwolves, who could play spoiler on their final regular season game on Wednesday, if they want the second seed in the West. A win over Minnesota will give Denver homecourt advantage for the first two rounds of the playoffs — if they make it that far — which was a positive component in Tuesday’s game. A negative was undoubtedly the defense against Donovan Mitchell. There is always going to be some animosity when it comes to fans and Mitchell after Denver traded their pick to Utah which eventually turned into Mitchell. He had a phenomenal game against the team that traded the opportunity to draft him. By the halftime intermission Mitchell was already up to 27 points to give the Jazz a one-point lead and he did not stop there. He finished with 46 points on the night going 14-26 from the field and 13-16 from the free throw line. He was surgical in the Jazz’s attack as he dissected the Denver defense. He hit 3-point jumpers, fadeaways, got to the rim at will, and was a force all night long. Moving into the playoffs, Denver’s defense will have to do a better job at limiting big time scoring performances like the one that Mitchell had. Denver’s defense has been up and down this season and Mitchell’s Tuesday night’s performance displayed exactly what will happen if you allow a scorer of his magnitude to get going early on. For as strong of a game as it was for Harris, Murray and the bench unit, it was not as great of a game for Jokic or Will Barton. Jokic has arguably his worst game of his career as the All-Star finished with only two points on 1-6 shooting from the field to go with two assists and five rebounds. To make matters worse he also fouled out in only 16 minutes of action and never got into a rhythm. Barton, on the other hand, finished with 0 points on 0-3 shooting from the field in 20 minutes of action. He was not aggressive, did not put up resistance defensively and looked as if he were just going through the motions. The Jazz are one of the few teams in the league that are able to limit Jokic’s production. Utah is able to give Jokic so many different looks and, on top of that, they have one of the best defensive bigs in the entire NBA in Rudy Gobert who makes things difficult for Jokic. Denver will have to find different ways to get Barton going and, more importantly, their best player on nights like this. Denver got lucky with how other things shook out in the West but cannot afford to have another game like their loss to Utah as they approach one of the most important stretches that they have had in six seasons.